Barbados Pride batsman Shamar Springer plays a shot against the TT Red Force, at the Brian Lara Cricket Academy, Tarouba, yesterday. THE TT Red Force were in serious trouble last evening, in their West Indies Four Day Championship fifth round day/night match against the Barbados Pride, at the Brian Lara Cricket Academy, Tarouba. After dismissing the Red Force for 170 early on the final session, on Thursday evening, the Pride closed the day on 52 runs for the loss of three wickets. Yesterday, they pushed on to 215, with Nicholas Kirton and Shamar Springer both scoring 47. For the Red Force, pacers Odean Smith and Anderson Phillip took 3/32 and 3/73 respectively. The Red Force, up to press time last evening, were 29/3 with Barbados-born opener Kyle Hope on two (off 55 deliveries) and captain Denesh Ramdin on five. Jamaican-born fast bowler Marquino Mindley took all three wickets to fall, all to catches in the slips. Left-handers Jeremy Solozano and Amir Jangoo were held by Jonathan Carter at first slip, while Mohammed edged a loose drive to Anthony Alleyne at third slip. 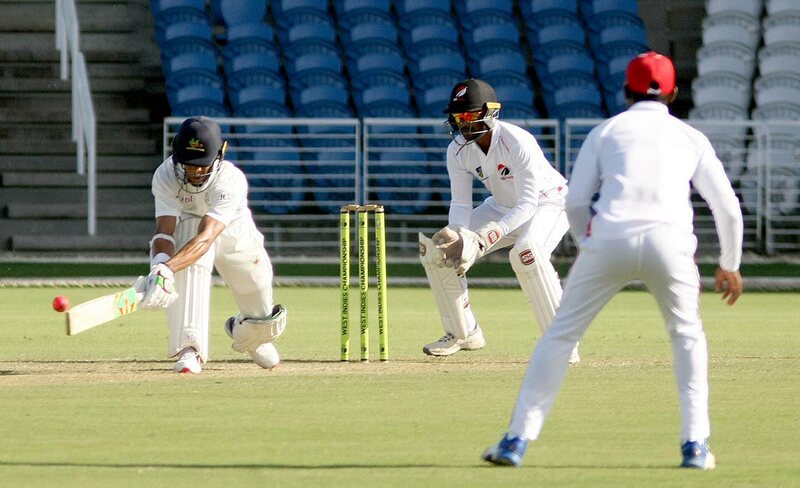 Things looked upbeat for the Red Force as they got two wickets early in the first session yesterday. Barbados captain Jonathan Carter was squared up by a ball from Phillip and nicked to gully, and Kevin Stoute got a faint edge from one around the wicket by left-arm pacer Daniel St Clair and was taken by Denesh Ramdin behind the stumps. Kirton and Springer, a pair of slimly-built players, tilted the balance in the Pride’s favour with a crucial sixth-wicket stand of 76 before the left-handed Kirton (126 balls, seven fours) missed an attempted drive and lost his off-stump to Phillip. Springer continued to take the fight to the Red Force bowlers, with five fours and three sixes in his 85-ball knock, before edging Phillip low to Jangoo at second slip. Tevyn Walcott battled with the tail to give Barbados a slight first innings advantage, as he was unbeaten on 23. Ashley Nurse reached 19 before he slashed at a wide ball from Smith and edged high to Jangoo at first slip. The spinners then got in the act, with Khary Pierre trapping Keon Harding leg-before and Imran Khan shattering the stumps of Mindley. On Thursday, Stoute finished with figures of 6/35 and Mindley 2/34. Stoute took the last two wickets with St Clair (10) edging low to Nurse at second slip and Yannic Cariah leg-before for a top-score of 36. Smith took care of the left-handed openers Alleyne (via an edge to Ramdin) and Shayne Moseley (who parried a ball that bounced awkwardly to Pierre at gully). Aaron Jones never looked settled, and he was bowled by St Clair for a duck. Fall of wickets: 29; 31; 33; 55; 71; 147; 167; 198; 212; 215. BOWLING: Phillip 21-4-73-3 (W1); St Clair 19-5-59-2 (NB8); Smith 16-5-32-3 (W2, NB6); Mohammed 1-1-0-0; Pierre 10-4-30-1; Khan 4.3-1-15-1. Still to bat: Y Cariah, I Khan, O Smith, K Pierre, D St Clair, A Phillip. Fall of wickets: 5; 10; 21. BOWLING: Mindley 8-3-20-3 (NB3); Harding 4-3-5-0; Stoute 4-3-1-0; Springer 1-0-3-0. Reply to "Red Force in trouble against Pride"